H.B. Charles, Jr. was born on February 11, 1973, in Los Angeles, California to Dr. H.B. and Ellen L. Charles, Sr. He made a personal profession of faith in Christ as Savior and Lord, and was baptized, at the age of six. At the age of eleven, H.B. 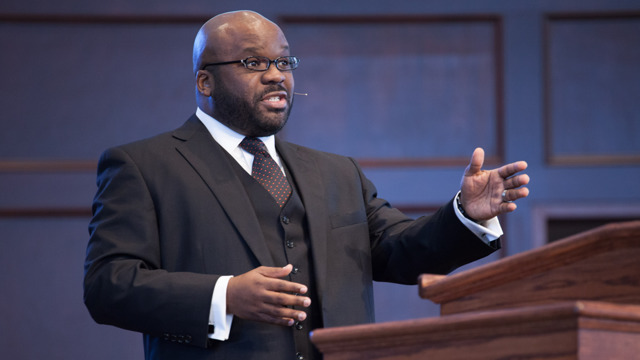 began his public ministry at the Mount Sinai Missionary Baptist Church, under the watchful eyes of his father and the other pastoral leaders of the congregation. Many and diverse speaking opportunities, both within and beyond Mount Sinai, helped H.B. to rapidly and progressively develop in preaching and teaching. Likewise, these years of assisting his father and ministering to his fellow young people trained H.B. in fundamental aspects of spiritual leadership. In June of 1989, the Lord called Dr. Charles, Sr. from labor to refreshment, leaving a personal and ministerial void in H.B.’s life. But the Lord used this dramatic time to further H.B.’s growth in grace and the knowledge of the Lord Jesus. And on November 5, 1990, Mount Sinai ended a year-long pastoral search by selecting H.B. to succeed his father. At the time, H.B. was a seventeen-year-old senior at Los Angeles High School.After graduating from high school, H.B. studied at a small Bible college in Anaheim, California that provided the opportunity for him to further his education while serving Mount Sinai Missionary Baptist Church. But he was only able to complete a couple of semesters of study before his increasing pastoral responsibilities necessitated his full attention.However, this short time of formal study introduced H.B. to expository preaching. And he has since been a growing and faithful student of Bible exposition. Over the course of H.B.’s pastorate, his love for God’s Word, the church, and lost people, have been obvious to both the membership of MSMBC and the larger church community. This has resulted in H.B. balancing his pastoral responsibilities with speaking engagements in revivals, conferences, and other church events around the Greater Los Angeles area and across the country. This includes denominational service on the local, state, and national levels. On December 12, 1998, H.B. married his best friend, the former Crystal Moreland. They are the proud parents of H.B. Charles, III, Natalie Marie & Hailey Breanne Charles. In 2002, H.B. was graciously invited to contribute a chapter to the John Knox/Westminster Press publication, Power in the Pulpit, edited by Dr. Cleophus J. LaRue. H.B. continues to seek further education to help fulfill his prayerful desire to write and teach alongside his calling to pastoral ministry. On July 30, 2008, Shiloh Metropolitan Baptist Church of Jacksonville, Florida, ended a seven-month search for a pastor when the church unanimously called H.B. as pastor. H.B. prayerfully accepted God’s call to be the next shepherd to lead Shiloh.